Admission was free for Saturday evening’s show, and tickets were quickly claimed. 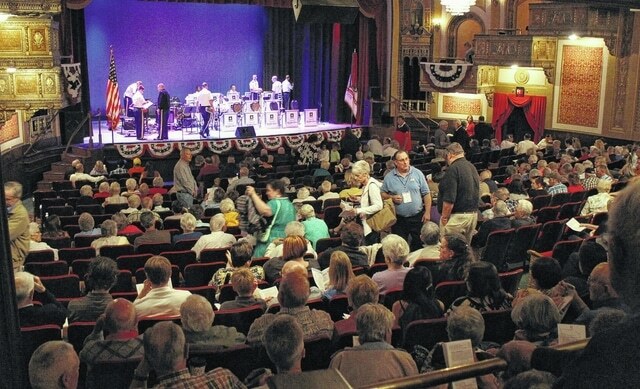 A full house enjoyed the Jazz Ambassadors of the U.S. Army Field Band Saturday night at The Murphy Theatre. Nineteen of the military’s most talented jazz artists were the featured performers Saturday at The Murphy Theatre. The color guard from American Legion Post 49 in Wilmington presents the colors Saturday evening as the Jazz Ambassadors of the U.S. Army Field Band entertained a full house Saturday night at The Murphy Theatre. Wilmington Mayor Randy Riley introduced the band, which played big band, bebop, Latin, contemporary jazz, standards, popular tunes, Dixieland, vocals and patriotic selections. The Jazz Ambassadors have appeared in all 50 states, Canada, Mexico, Japan, India and Europe. The Wilmington News Journal sponsored the event. The Murphy Theatre was packed Saturday evening for the Jazz Ambassadors of the U.S. Army Field Band.